The supposed leak of Facebook’s data through Cambridge Analytica reads a bit like a spy thriller — a researcher develops an app to collect information for academic purposes. He goes rogue, and ends up selling the data to a shadowy corporation. The corporation then uses it to help elect the US President, and changes the course of human history forever. 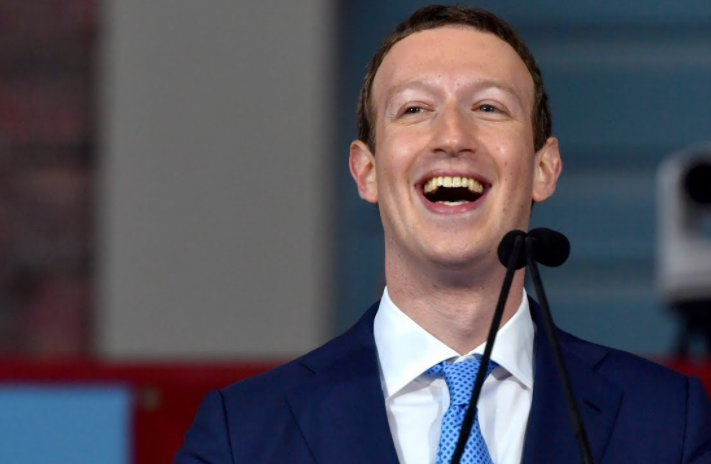 But it turns out you don’t really need to be a high tech firm with tons to data to influence elections — Facebook’s inbuilt tools can pretty much let you do it while you’re sitting alone in your bedroom. 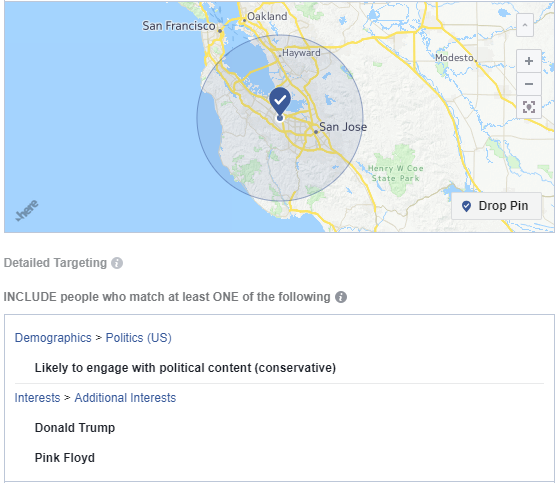 Facebook’s ad targeting tools, OfficeChai discovered, contain some incredibly specific options for people who wish to show ads of a political nature, and are available for anyone who creates a Facebook page. While advertising on Facebook, the company lets users pick the audience the ads will be shown to — someone selling superhero T-shirts, for instance, can show their ads to people who’ve shown interest in Superman and Batman, and someone advertising a rap concert can choose to show their ads to people who’ve shown in interest in Jay Z and Eminem. But Facebook allows for some very specific targeting for political ads. Under the broad umbrella of US politics, users can choose to display their ads to liberal, moderate, or conservative audiences. Facebook doesn’t stop there — there are also options to show your ads to very liberal and very conservative people. 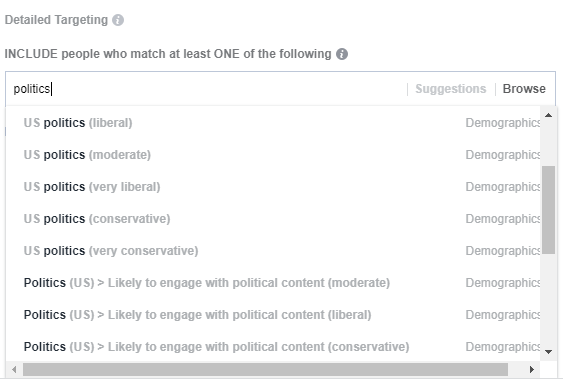 And Facebook even has subcategories — under these options, there are further options to show your ads to people who’re “likely to engage” with political content. There are, of course, infinitely many other subcategories you can add to this: a Facebook page owner, for instance, can choose to have their ads shown to women between the ages of 30-35, who’re very conservative and highly likely to engage with political content, and are also interested in Donald Trump and Pink Floyd. A clever marketer could then design a creative that says “Here’s to another brick in the wall,” and have it blasted into the timelines of these very specific people for as little as $1/day. And it’s very likely that the results from such a campaign could be better than the results of those conducted by Cambridge Analytica. Cambridge Analytica had details of people’s Facebook’s likes from a single point in time in 2014, but Facebook has access to a whole lot of more updated information, including not only what users like, but also what sort of content they engage with, what times of day they log on, who their friends are, and what they, in turn, like and engage with. If Facebook can distill all these factors to create a subcategory that’s as specific as “very conservative people likely to engage with political content,” you’d have to believe that their algorithms are just as effective, if not better, than Cambridge Analytica’s. What does this mean for the current panic around data privacy on Facebook? It means that concerns around Cambridge Analytica’s interference in elections might be overblown — Facebook can let a savvy marketer target people pretty much the same way as Cambridge Analytica had supposedly done. But it also means that governments and regulators need to keep a very watchful eye on Facebook. Cambridge Analytica or no Cambridge Analytica, Facebook by itself has enough tools which, given the right budgets and some smart marketers, can influence the course of elections the world over.